Why The Bible Is Called The Bible? Is It Really Holy? Where did the name the “Bible” come from? Why is it called the Bible and is the Bible really holy as it claims? Strictly speaking then, the Bible is called the Bible because it is a collection of books and these books are inspired by God and said to be written by the Holy Spirit so the Bible is actually God speaking (2 Timothy 3:16). The Bible is God speaking. Why do we say that? Because there are 418 times that the Bible uses the term “Thus says the Lord” and then there are 48 sayings of “God said“, but if you add the times when it said, “And Jesus said” we have over a thousand more sayings that the Bible is God’s Word or God speaking. The total amounts to about 2,000 times that the Bible declares that God is speaking, either in the text or by Jesus Christ Himself, Who is also God. Why do I say these things? Because as Hebrews 4:12 says that, “the word of God is alive and active. Sharper than any double-edged sword, it penetrates even to dividing soul and spirit, joints and marrow; it judges the thoughts and attitudes of the heart.” God’s Word has power and it has effectual power. That is, it has power to affect a person and convict them of their sin. God has said that the “word that goes out from my mouth: It will not return to me empty,but will accomplish what I desire and achieve the purpose for which I sent it” (Isaiah 55:11). The Word of God is like a seed…it is planted in the human soul and causes growth. The Word of God is like a seed…it is planted in the human soul and causes growth. It is like a hammer in that it breaks up the stony, hard places in my heart. It is like a fire as it refines, purifies, and burns away the dross (the impurities). It is like bread because it gives us our daily sustenance and allows us to survive. It is also like a sword as mentioned in Hebrews 4 because it cuts to the quick and penetrates our thoughts and intents that are unseen by human eyes. There is so much power in the Word. The power is in the message but never in the messenger (the preacher). 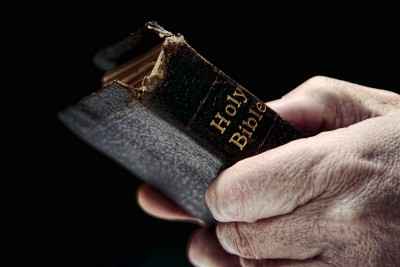 Most covers of Bibles have written, “The Holy Bible.” Why is this so? The short answer is because it is holy. Anything that is of a divine source is holy because God is holy. Isaiah 6:2 says, “holy, holy is the Lord Almighty; the whole earth is full of his glory.” This is the only place in the entire Bible where an attribute of God is mentioned three times and that He is holy, holy, holy. You never read, God is merciful, merciful, merciful, or God is love, love, love. Why? Because above all His attributes I believe that He is holy and above all things created. Because God is so holy, everything He says is holy and since God the Holy Spirit is the author of Scripture, we must conclude that all the words of the Bible – in fact all of the Bible is holy. Holy means many things but it certainly means perfect, without fault, without blemish, like Jesus was said to be the spotless Lamb of God – without blemish. He is altogether otherness, distinct from all His creation, and set apart from all that is. It is written that God can not lie because it is not in His nature for He is true, faithful, just, and completely perfect in each and every way. The Bible is holy because the Author is holy. Second Peter 1:20-21 is clear about this as Peter wrote, “that no prophecy of Scripture is of any private interpretation, 21 for prophecy never came by the will of man, but holy men of God spoke as they were moved by the Holy Spirit.” Many criticize the Bible because they say it was written by man but not so! God says in His Word that these men were moved (Greek indicative means “taken control of“) by the Holy Spirit. Here is an example. The keyboard really wrote this article and that can not be disputed but who is the real author of this article? The keyboard? No! It is the man behind the keyboard and so it was with the holy words men written under the “control of” the Holy Spirit as they were moved by the Holy Spirit. Since the Bible is God speaking to us, it is therefore holy because God Himself is Holy. It is God-breathed as 2 Timothy 3:16-17 says, “Scripture is God-breathed and is useful for teaching, rebuking, correcting and training in righteousness, that the servant of God may be thoroughly equipped for every good work.” Jesus Christ is holy and He is also the Word and the Word was God and the Word is God (John 1). God is holy and tells us that we too must be holy. Only those who are declared righteous are allowed to enter the Kingdom of Heaven. That presents a problem because “without holiness no one will see the Lord” (Hebrews 12:14b) but here’s the solution. In 2 Corinthians 5:22 it says that “For our sake he made him to be sin who knew no sin, so that in him we might become the righteousness of God.” Problem solved! We can enter the holy of holies because of the blood of the Lamb of God, slain for us before the foundation of the world no less (1 Peter 1:20)! Put your trust in Christ today and you can be declared holy and blameless before God because God will then see you has having Jesus’ righteousness. Yes, the Bible is holy because God is holy and His word is holy. The fact is that anything that is of God is holy and that absolutely includes the Bible, which is the Word of God and nothing less. Come to Jesus today because the Word of God died for you to make you holy so that you could enter that place that only those who are holy may enter. Why? Because God is holy and everything about Him is holy, which means that the Bible is holy. Of that I am thoroughly convinced. This is a really good article Jack. Thank you for expounding on how Holy God and His Word is. Indeed, the Bible is Holy and it does have power and life in it. It can melt the heart of stone. It can bring a dead soul to life. It can bring knowledge into doubt. It is the One and only source of real truth! God bless you brother! Wonderful job! Thank you my brother. I fall prostrate before His Word and before THE Word of God, Himself. The power in His Word is enough to raise Lazarus from the dead and those who were dead in their sins like me. Thank you for your encouraging words. This article make my heart dance! Thank you for working for our Lord Jesus Christ. I also was dead in my sin but now saved through His beautiful, powerful and Holy name. Thank you for this article, Jack. I pray that people truly believe that the Bible is a message from God and treat it as such. What could be more important than the Words of our Creator, Savior, and Sustianer? Sometimes it amazes me how flippantly some people regard the Bible. God bless you, brother. Keep up the good work. Amen Robert. As I told Emela. I fall to the ground in recognition that our God and His Word, all of them, are Holy, Holy, Holy and I am altogether not! Every Word is eternal and precious and will abide for time without end. Thank you sir. Thank you so much Emela. I fall to the ground in recognition that our God and His Word, all of them, are Holy, Holy, Holy and I am altogether not! Thanks for this wonderful revelation more grease to your elbow. What gracious words of encouragement sir. May God richly bless you and thank you and I thank God for you. So true James. I believe that I would be like Isaiah or the apostle John…that I would fall flat on my face as a dead man before His Holy Presence. Thank you sir. Thank you my friend. Great question. The reason that some of the extra-biblical books are not in the Bible is that they don’t all agree with the teachings of the Old Testament writers and those in the New Testament and in the Old Testament, even the Jews do not accept many of the Apocrypha books. Please read this to find out which books should be and which books shouldn’t be in the Bible. I believe it will clear it up nnadozie. Thank you. Thanks this is so great. I like this, but I also was wondering something else about the Bible. Why is it divided into verses? The definition of a verse is “writing arranged with a metrical rhythm, typically having a rhyme” and is often used in terms of poetry. In the Bible some spots are written like poetry but not all of it, so why use this term? Hello Mr. Hurst. God does not change. His covenant changed with Jesus Christ’s coming, but read the Book of Revelation if you think God is more kind and loving. He is God and He will demand justice of all who reject the Son. There is no “why?” but God is God and He changes not. Only the covenant has changed through Jesus Christ. Next post: What is Maundy Thursday? Is It Important?